A walk from Beddgelert via Bryn Ddu, Pont Aberglaslyn and the fisherman's path. 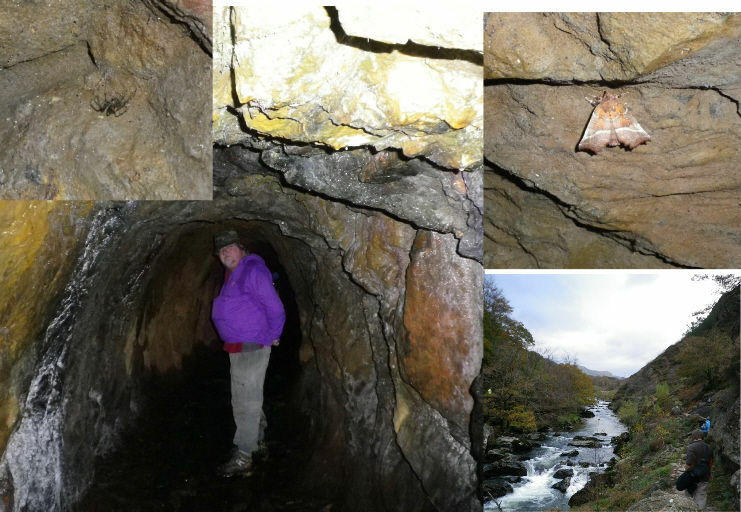 The attached composite picture shows (working clockwise around from the main photo) the inside of the riverside adit (a horizontal passage) of the Aberglaslyn copper mine, a Cave Spider (probably Meta menardi ) – surprisingly large, a hibernating Hawk Moth and finally a view toward Beddgelert up the Afon Glaslyn with the fisherman’s path to the right. Yes and it has been another holiday to Wales with picture postcard weather to begin with – snow on the tops above about 2000ft. The attached picture does show the lengths (or depths) I go to collect new material. But saying that I have been curious about what this mine level was like for nearly 12 months after discovering it by the side of the fisherman’s path last November. This time we returned with head torches and suitable headwear for a brief exploration while out walking around the Bwlch Aberglaslyn (Aberglaslyn Pass). This particular walk was done on the Wednesday 7th November and was chosen because there was a lot of heavy cloud down over the high tops. This walk took us up above the pass to the west over the top of Bryn Ddu (Black Hill) via a detour to some amazing broadleaf woods by some old mine workings that had a strange, but not unpleasant, feeling to them (they could quite easily have been inhabited by fairy folk – like somewhere where two worlds meet). I got material hear for future painting projects – mossy rocks and trees and all that. Some good views were had from the top of Bryn Ddu before descending through Aberglaslyn woods (first through pine and larch then broad-leaves) to Pont Aberglaslyn. This bridge was supposedly built by either the Devil or Robin Ddu a magician and poet (c1450) from Anglesey – Robin also used to hang out in a local pub called Y Delyn Aur (the Golden Harp) close to the bridge. If you have spotted that Bryn Ddu is Black Hill you can probably deduce that the gentlemans English name was Black Robin – I wonder if there is any connection with the hill? It doesn’t really matter if it was the Devil or Robin who built the bridge the result was the same as they claimed the soul of the first living thing or person to cross the bridge. Ha - so safely over the bridge complete with soul in tow we headed up the East bank of the Afon Glaslyn using the fisherman’s path to reach the mine level by a little wooden bridge. This was used to search for copper and probably dates from around the mid 19th to early 20th century. It is quite safe and solid at the entrance with no loose rock (I am experienced at caving so I know what I am doing – I hope). One should always keep your eye on the floor in these levels as you never know when there might be a big flooded hole in the floor, also look out for rotten pit props and the like and same goes for the floor – rotten planks can kill easily. No such worries in this level though as it appeared to be solid rock throughout. The thing that stopped further progress (we got in past the point of light coming in from he outside) was the tunnel floor starting to flood and I didn't want the muddy water coming over my boots – so wellies next time but I suspect it floods fairly quickly from the point we reached. On turning round to return to the surface I was confronted by a giant orb web – this would be Metellina merianae a brown orb web spider with spotty legs. Next came the hibernating moth – some sort of Hawk Moth and then the giant black spider Metellina menardii another orb web spider of similar shape to the brown one but larger. Strangely it builds a smaller flatter web but far sturdier. All that there is left now is the walk back up the Aberglaslyn Pass and its waterfalls and stunning scenery to Beddgelert and the car. It was a full afternoon’s walk of about four and a half hours with some amazing material collected for paintings and painting classes. Other walks for the holiday included Snowdon and snow, a walk up the Afon Llugwy with views down the Dyffryn Mymbyr to the Snowdon Horseshoe from the tops above Capel Curig, Portmeirion and Porthmadog, Anglesey and finally the Llamberis Pass. Perhaps if I get time I might write about some of these but the paint and paper is beckoning and its taken me most of the afternoon to put this together. So watch this space.